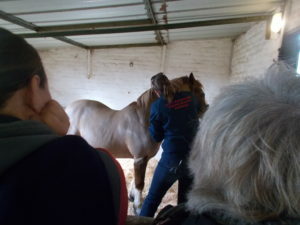 Lincolnshire members attended a demonstration of equine massage led by Lucy Makepeace held at the yard of Anna Jackson today 17th February. Anna’s handsome 21 year old Section D gelding was very obliging and was walked and trotted up first of all so that we could all have a chance to look at any irregularities in his gait. Lucy explained to us how horses can compensate for any pain by changing the way they move. These changes may not be addressed immediately by any remedial work as the brain may have learned the pain and muscle memory may prevent the massage taking effect. Miles condition was also discussed before we went to watch the demonstration. Miles stood quietly while Lucy explained the different techniques she uses and what is achieved by each level of massage. We then had the opportunity to be hands on ourselves while Lucy kept an eye on our efforts. 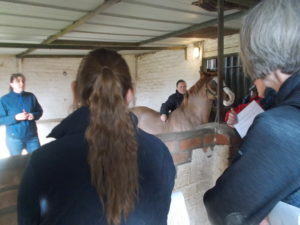 We discussed condition scoring and types of feed and wormers as Lucy is also qualified to prescribe wormers and has a good understanding of feed and nutrition with links to Dengies feed and nutrition experts. We had the chance to complete a Dengie form which will enable the Dengie team to suggest different feeds from their range. Lucy pointed out that she is not employed by Dengie. Lincolnshire Area Report May 2016. On 23rd April a road drive set out from Fleet Fen and meandered through the village of Gedney where some of the turnouts commented on the lovely old parish church building. The route then took us through the hamlets of Gedney Broad Gate and Clarks Hill, ending our circular route back at Fleet Fen after about two and a half hours. There were eight turnouts in total, some of which had come quite a distance to join in. We must have created quite a spectacle as local residents watched us pass by. As to be expected in April we had a mixture of weather, sun, rain, hail and wind but we were able to see that spring was just waiting to happen as many of the gardens we passed had a good display of colourful plants and flowers and the trees were just starting to make an effort to show a bit of greenery. The ponies and horses all seemed to enjoy the first drive out together with some getting quite strong, they all arrived back to the home field and enjoyed being made comfortable with either hay nets or a nibble at the early grass. Whips and grooms then all congregated in the yard where we enjoyed hot vegetable soup and rolls followed by two different cakes. A good social time followed with groups chatting and sharing their experiences and thoughts of the next event. The first of May saw most of us at Grimsthorpe Castle Charity Drive and although this was not a BDS event it was organised by some BDS members and well publicised. Some participants of this event had come significant distances but it was totally worth the effort and our thanks were given for such a super drive in lovely parkland. 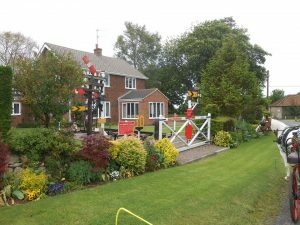 There was a wide variety of turnouts, with some very smart carriages and some with their Dalmatian dogs in attendance. The route took us past some spectacular scenery and we all had some photos taken by volunteers which we were able to purchase if we wanted. Again a good social time followed the drive and delicious cakes were offered by the organising committee. The proceeds from this event go to the local parish charities. 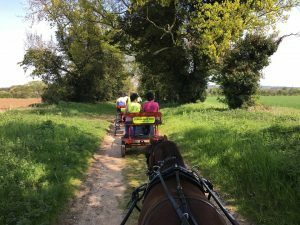 A weekend gathering was our next event and took place over 7th and 8th May at Abbey Farm in Norfolk where we were joined by Norfolk members. There were 8 turnouts from Lincolnshire again six of which had come for the full weekend and either camped on site or enjoyed the B+B at the farmhouse. The weather was very hot and we split into two groups as the people with smaller ponies wanted a less challenging route. 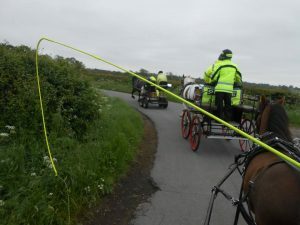 This took us along sandy tracks along field headlands, though some wooded areas which provided some welcome shade, there was a short distance to travel on the road as we approached home and the traffic was quite busy but we all returned safe and sound. We made our ponies comfortable and then sat to eat our picnic lunches and chat. The second group of larger equines set off for a longer drive after lunch and took in some similar terrain. This location is mainly off road and we were able to enjoy seeing the livestock in the fields enjoying good grazing and some hot sun. 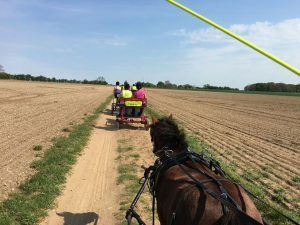 Early June, rather chilly to say the least, and Lincolnshire members ventured out mid-week to explore the BHS Paralympic Legacy Access Project route at Newton (PLAP). We parked up on a wide grass verge and despite a few worries about locating each other we all did end up on the same bit of road. Pete was on watch duty whilst we were away from the vehicles, sadly this is necessary. This isn’t a single route but a jigsaw of connecting quiet lanes, green lanes and other routes with public access. We avoided the ford at Walcott as it had an exceedingly slippery bottom and trotted our way through the prettiest of villages, saw some beautiful views and avoided the dustcart which was the only big vehicle on the entire route. Our variation on the route saw us cover 13.3 miles. You could easily do just a few miles or extend it to cover more. Our next event is Brocklesby Country Fair on 19th June followed by a drive on 3rd July from Kirby Underwood and a weekend at Orchard Farm near Skegness mid July. Further dates are to be found on the calendar list on the website.